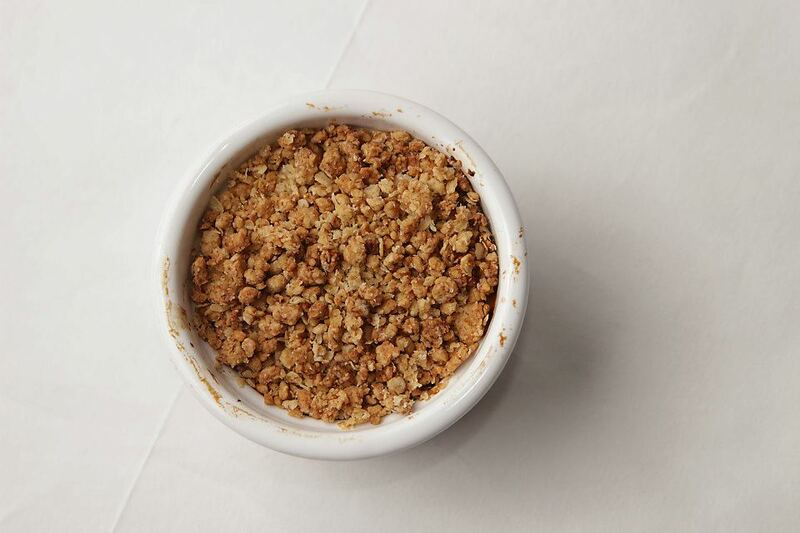 Everyone loves a good crumble – A crunchy block broken into bite-sized crumbs with the gentle poke of a fork. Buttery, fragrant and delicious with dripping apple sauce or a dollop of cranberry jam. But you’d hardly realize that a good crumble is also horrifically calorific – Just check out any crumble recipes and most would contain a shocking amount of sugar, butter and flour. I wonder why these sinful things just taste so good even though they might also clog up your arteries too soon. I’d been trying to cut down on my calorie intake these days, which many might find surprisingly since I am well known for having a mega cow-like appetite. Maybe it’s because I have been falling ill with the recent drastic weather changes (rain –> shine –> wind –> hail) so I have been starting to seek comfort in healthier, lighter alternatives. So here’s a healthier alternative to the usual calorie-laden crumble – An oat crumble that replaces most of the plain processed flour with old-fashioned rolled oats! An oat crumble isn’t necessarily less tasty than the usual crumble – The roasted/toasted rolled oats taste especially fragrant after roasting. They also have a nice crunch even with minimal baking in the oven, staying airy and crispy even after storing away for a week or so. 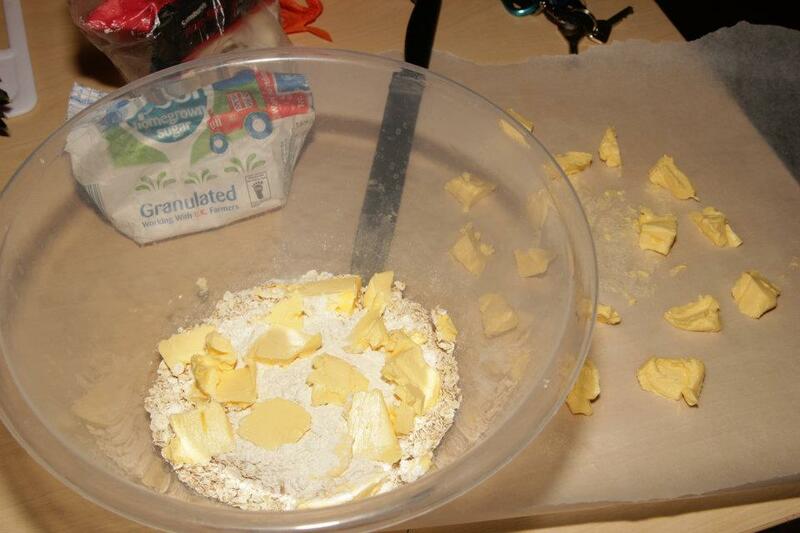 They also require less butter since the oats hold together easily on their own, unlike fine plain flour which requires a great deal of grease to clump up. For this recipe, I have also reduced the sugar – Feel free to add more to taste! 1. In a large mixing bowl, mix together all the dry ingredients: Rolled oats, wheat flour, sugar, cinnamon powder, and salt. 2. Bit by bit, add in the small cubes of unsalted butter. With clean dry hands, rub the butter into the other ingredients slowly and thoroughly, making sure there are no unnecessary clumps. 3. Decide if you want your oat crumble loose or compact – If the latter, knead a lot more until the mixture becomes a more sticky dough-like crumble. 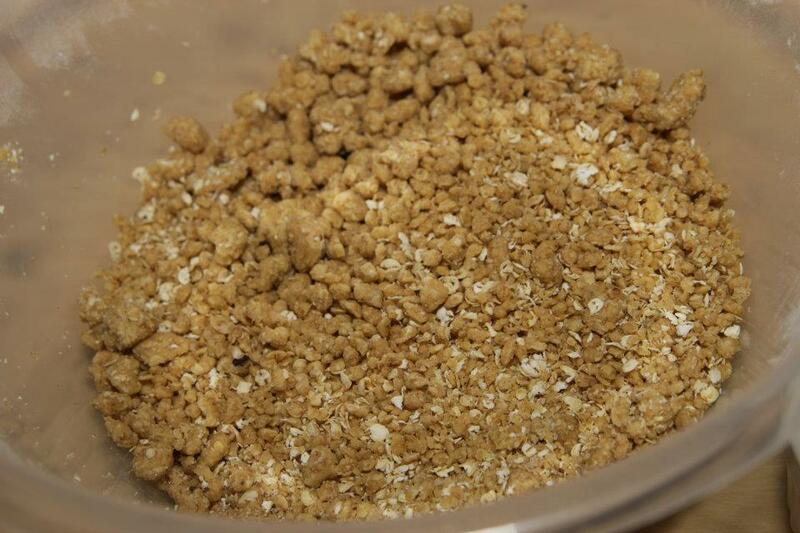 Although this looks a little like sand, it’s actually the loose crumbly oat mixture. 4. Place on top of pre-prepared fruit base (ie like in apple crumble) or simply place in shallow dish if you want the crumble on its own. Bake in pre-heated oven at Gas Mark 5 for 30-45 minutes until it turns golden brown!